Legal fees in drastic decline: How will firms recover? Legal fees are rapidly falling and most firms don’t understand the consequences, according to recent Beaton Research + Consulting statistics. Over the past seven years the Australian-based customised research and evidence-based consulting house that works with clients globally and also has a strong NZ focus, has been gathering evidence on a wide range of strategic issues, including clients' perceptions of fee levels. Executive chairman Dr George Beaton, who is also a partner at Beaton Capital, says the findings are the first to authoritatively document the fact that fee levels of law firms at the big end of town have been steadily falling for the last five years – at least insofar as their clients are concerned. He told NZ Lawyer's sister publication Australasian Lawyer that there are two sides to the problem. 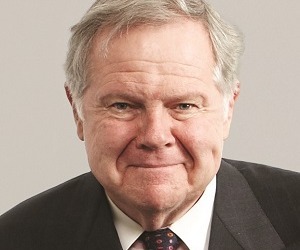 A sustained fall in price, he says, whether actual or perceived by clients – is one of the surest indicators of a structural trend and life cycle maturity. This means that when price is falling, the market is hyper-competitive, the war is for market share, and too often the major weapon used by firms is price discounting. Firms need to address this issue now or risk seeing their profitability halve within 10 years - or as early as five years - based on these statistics, he says. To alleviate the impending problem, firms must start re-engineering their business models to something more flexible, use technology to reduce costs, outsource back office services and begin offering clients fixed fees or alternative fee arrangements. “Also, those who understand what it takes to communicate value to clients – cost consciousness – will be shielded from this,” says Beaton. Corporate and commercial firms who have a “mixed” practice and high fixed cost premises even though the price of work is falling will be the most affected by these predictions. On the other side of the coin, boutique firms who have a specialty, or high end corporate advisory firms will be the most protected, he says. 1: Are we doing the right things to mitigate the impact on our profits of clients' perceptions of steadily falling fee levels? 2: Are we sure our overall value proposition is right for our clients? 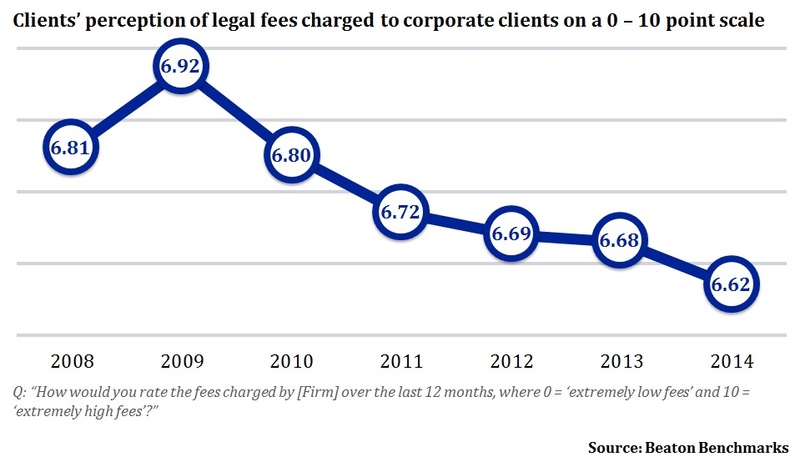 This first chart shows the average rating of fee levels by about 5,000 buyers and users of commercial and corporate legal services each year from 2008 to 2014. The year-on-year falls in perceived price are statistically significant and the consequences for those firms that don't realise this – and that don't act now – are predictable and dire. Falling profitability. That's why Question 1 is cogent – and hard. And the Board should not rest until it receives convincing answers and sees demonstrable, sustained strategic actions producing measurable outcomes. This second chart helps inform answers to Question 2, and looks at clients' perceptions of fees versus service for the 11 largest corporate and commercial law firms in Australia. From a client's perspective, a value proposition comprises what the firm offers clients and what price (i.e. the client's perception of fees) it asks for the delivery of the benefits in its offer (i.e. clients' perception of overall client service). This chart maps clients' perception of fees (reported in the same way as in the first chart) and their perception of the overall client service they received in the last 12 months. The diagonal line has been statistically fitted and the R2 number of 0.69 explains how much any change in perception of overall client service can be explained by changes in perceived fee levels, and vice versa. When firm 3, represented by the red dot, and firm 11, represented by the green dot, are removed from the analysis and the R2 is re-calculated it rises to 0.89. 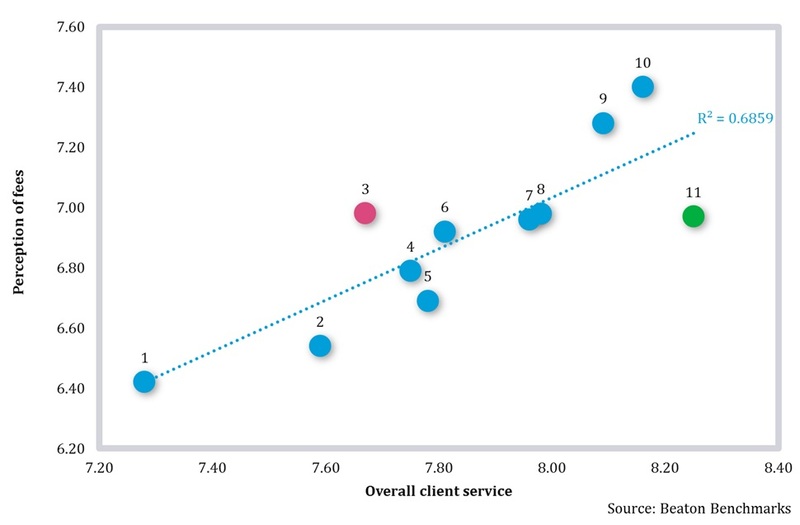 This observation suggests firms numbered 1, 2, 4, 5, 6, 7, 8, 9 and 10 have their overall price pretty much in line with the overall client service, as their clients perceive both. The red firm is over-charging for what it delivers. And the opposite applies to the green firm: It is leaving partners' money on the clients' table. by Ashley Balls 3/07/2014 10:23:07 a.m.
At last, some support for the view I have been espousing since '07 - prices in real terms have been falling. It is a function of supply and demand and a concentration on pricing strategy is to seriously miss the point. When there is a surplus of lawyers (relative to the volume of instructions received) adjusting prices or attempting 'new/different' pricing strategies is the management equivalent of re-arranging the deck chairs on the Titanic. The future lies in raising productivity whether its from the application of IT to outsourcing; the opportunities are legion. But doing nothing is not an option. by Brent Wheeler 3/07/2014 11:15:07 a.m. Very useful. The need to reassess business models has been clear for some time. An absence of even moderately modern governance practice ( a 30 plus Partners Committee does not remotely resemble a Board or useful governing mechanism for example) is an issue the legal profession could profitably address.